The more I hear of the music of Mieczylaw Weinberg (1919-1996), the more significant he becomes in my mind. The disk in question today, Chamber Music for Woodwinds (CPO 777 630-2), fleshes out a picture of the composer as a singular visionary in the chamber mode. Four works get sympathetic, finely articulated treatment by the performers, and cover a period from 1945 through 1981. They include the "Sonata for Clarinet and Piano op. 28," "12 Miniatures for Flute and Piano op. 29," "Sonata for Bassoon Solo op. 133," and the "Trio for Flute, Viola and Harp op. 127." Each piece has its own character, with contemporary elements, some Jewish folk melodics combined with an Eastern European modernist sensibility, and structurally flowing architecture. The works do not sound as if they could have been written by someone else for the most part and to my mind mind rank with Poulenc and Hindemith's woodwind music as some of the finest examples this past century has to offer. They are played with great vivacity by Elizaveta Blumina, pianist and artistic director of the program, Wenzel Fuchs on clarinet, Henrik Wiese on flute, Mathias Baier, bassoon, Nimrod Guez, viola, and Uta Jungwirth on harp. 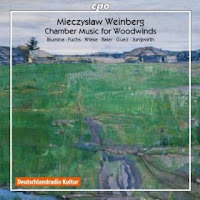 This one is a must for modern chamber enthusiasts and for serious listeners to the music of 20th Century Eastern Europe. Weinberg gives us a glimpse of his indiomatic mastery of chamber form with four excellently crafted works, excellently performed.